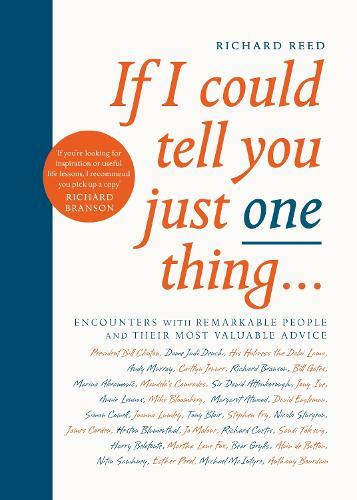 NOW WITH EVEN MORE REMARKABLE PEOPLE In If I Could Tell You Just One Thing... some of the world's most remarkable people share their most valuable pieces of wisdom. Including: President Bill Clinton, Clare Balding, Bill Gates, Stephen Fry, Dame Judi Dench, His Holiness the Dalai Lama, Caitlyn Jenner, James Corden, Margaret Atwood, Sir David Attenborough, Annie Lennox, Andy Murray, Joanna Lumley, Sir Richard Branson, Sandi Toksvig, Jude Law, Nicola Sturgeon, Harry Belafonte, Olivia Colman, Simon Cowell, Bear Grylls, Diana Athill, Jo Malone, Heston Blumenthal, Nitin Sawhney, Katie Piper, Richard Curtis, Shami Chakrabarti, and Michael McIntyre. If I Could Tell You Just One Thing... is not only packed with great advice but is also enormously entertaining, brilliantly written and stunningly designed. From advice on work and relationships, to creativity, spirituality and survival, there are words in these pages that will comfort, motivate and inspire.